This condition is non invasive and occurs when a person develops allergy to Aspergillus spores. This spore allergy is more materialized in patients with severe asthma, cystic fibrosis & bronchiectasis. Around 30% of asthma patients suffer from very severe asthma and most of them may be sensitized to numerous fungi spores – making up a new category known as severe asthma with fungal sensitization. If left untreated, ABPA can cause permanent damage to lungs. Most of the CPA patients may have underlying lung pathology like COPD, lung cancer, ABPA, cystic fibrosis, silicosis, asthma, emphysema, atypical Mycobacterium infection & stage III fibrocystic pulmonary sarcoidosis. Allopathic medicine came up with steroid therapy and long term antibiotic therapy to withstand Aspergillus spores, but may cause serious impacts on later life. 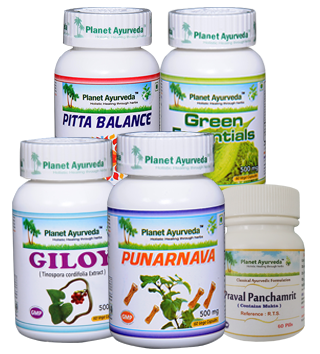 Planet Ayurveda offers a wide variety of herbal remedies, which are very effective to fight against Aspergillus spores and also to strengthen the immunity. 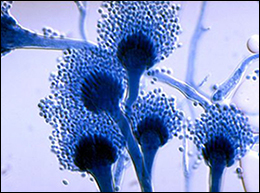 Consult your physician if you are in a risk with Aspergillus infection and take necessary steps to remove the underlying pathology that may risk you with Aspergillus infection. These capsules are very effective in pain relief. It is widely used for its diuretic and anti-inflammatory properties. It is very well known for its of revitalizing the lives and also helps in cleansing the blood. This is also good for lung health. It also has antimicrobial property. Dosage – 1 capsule twice daily after meals with lukewarm water. These capsules are prepared out of guduchi (Tinospora cordifolia). It is considered to be as elixir and do possess rejuvenating properties. It also has anti allergic, anti inflammatory, anti bacterial, antifungal and antiviral properties. It boosts the immune system and acts as an immune modulator. It is a natural antioxidant and helps in the detoxification of the body. Giloy capsule is a natural blood purifier. This helps to balance the aggravated pitta. There by reduces the foul smell of the coughed up sputum. It also helps to achieve mental clarity and minimizes negative emotions. Pitta balance is coolant in nature, thereby reduces perspiration. It is a rich source of calcium and helps in body building, thereby boosting the immune system. Thus strengthened immunity will effectively flush out the Aspergillus fungi spores. It is a natural blood purifier and a health promoter. It boosts up the immune system. It is rich in antioxidants and can effectively fight against illness. Its antimicrobial activity can remove the fungus infection. Green essentials contain the potent herbs like grape seed, wheat grass, spirulina, green tea and amalaki. The rich vitamin C content in the formulation boosts up the whole immune system. Dosage – 1 to 2 capsules twice daily after meals with lukewarm water. Panchamrit ras contains 5 bhasma that can act as an elixir of life. The 5 bhasmas are Praval bhasma, Mukta bhasma, shanka bhasma, sukti bhasma & karpadika bhasma. These bhasma together acts as an elixir. They help in longevity. They are anti-aging and have Rejuvenative property. Most of the ingredients of Praval panchamrit are calcium compound and helps in calcium supplementation. Also, it acts as rasayana. It also has antimicrobial action. It is also used to treat the underlying pathology like tuberculosis. Dosage – 1 to 2 tablets twice a day with lukewarm water. 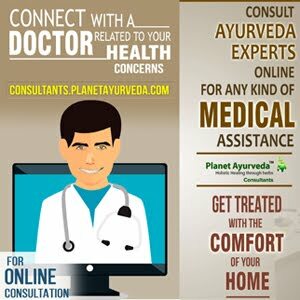 All these formulations are free from chemicals, preservatives, binders or fillers which may adversely affect the health, making them 100% herbal.